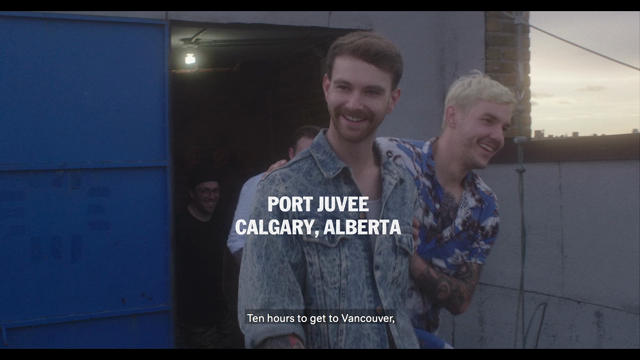 Who knew two guys on bikes would be so vital to modern Americana? 1969 represented the end of the ’60s in more ways than one. While Woodstock has come to symbolize love and peace, the Altamont Free Concert destroyed the hippie movement due to Meredith Hunter’s death at the hands of the Hells Angels. The Beatles started the year with their infamous rooftop concert, but by that fall, John Lennon had officially decided to break the group up. While Lennon was writing “Give Peace a Chance”, Charles Manson murdered Sharon Tate and other across the Atlantic. 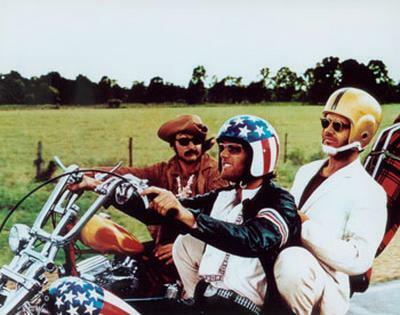 In the middle of all this change and chaos, Easy Rider hit theaters. Easy Rider is one of the best representations of the end of the ’60s as a cultural movement. The film follows two bikers nicknamed Captain America (Peter Fonda) and Billy (Dennis Hopper) as they ride across the nation hoping to make it to New Orleans in time for Mardi Gras. On the way, they run into a hippie commune trying to survive outside of society, a square ACLU lawyer, and two prostitutes with whom they experience a bad acid trip. The surprising end of the movie unintentionally sums up the way that 1969 has gone. It starts hopeful but ends in spiritual failure. The soundtrack to Easy Rider by itself does a wonderful job in conveying this idea. It kicks off with Steppenwolf’s “The Pusher”, one of most blatant songs about drugs from the ’60s. Within the first minute, John Kay’s declared that “the pusher don’t care/if you live or if you die.” “Lucy in the Sky With Diamonds”, this isn’t. Rather than sticking with the whole idea of free drug use, the song works to distinguish between drugs like marijuana and hard drugs like heroin. In the movie, the song’s accompanied by Captain America stuffing the cash he got from a drug deal into his fuel tank, adding a visual layer to the track’s meaning. “If You Want to Be a Bird (Bird Song)” by The Holy Modal Rounders is a juxtaposition in its musical delivery. Where the lyrics are fairly uplifting (“Why be shackled to your feet/When you’ve got wings/You haven’t used yet/Don’t wait for heaven/Get out and fly”), the music sounds like a demented circus soundtrack. It’s psychedelic but in a bad acid trip way. The piano sounds out of key and the vocals sound like they’re drunkenly yelled from the bottom of a well. During the movie, George Hanson (Jack Nicholson) has joined the two riders as they continue moving across the country. The track fits here because where Hanson would like to have the freedom the two riders have, he can’t break out of his shell enough to really do so. He also experiences the problem of true freedom firsthand when he’s violently killed by a group of Louisiana men who are angered by the trio’s looks and behavior. Though many of the tracks so far have had some sense of ’60s hope for the future, Bob Dylan’s “It’s Alright Ma (I’m Only Bleeding)” contains none. A cynical tale of the world’s problem follows over the next five minutes of the track. By now, the winter of 1969 has set in and the cultural changes of the decade have stalled. The death of Hanson and their bad trip in New Orleans cause Wyatt to say, “You know Billy, we blew it.” The journey was a failure, as they didn’t find the spiritual release they were looking for. The song is made even more tragic as their journey ends violently when the duo is gunned down on the road. 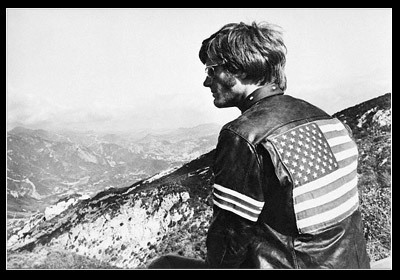 As a whole, Easy Rider highlights both the ups and downs of the final year of the ’60s. However, the focus is clearly on the downs. While great cultural strides had been made, the hippie movement couldn’t live up to its own ideals. Even though the movie wasn’t made with the specific problems of 1969 in mind, it really caught on to the subtle shift as the world moved into the next decade. The soundtrack that supports it only makes the changes all the more powerful.